The PureStation Sink Insert fits into pre-existing sink basins to raise the work level and reduce deep back bending and injury. It helps make staff more comfortable at the sink by easing the strain on backs and legs. The PureStation insert improves efficiency by providing convenient ways to monitor and mix proper enzymatic solution concentrations. 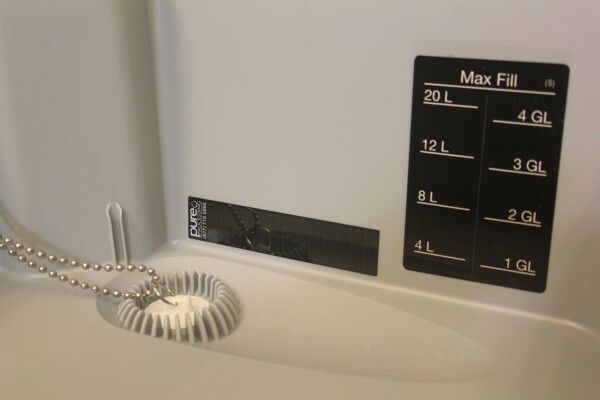 Each basin includes a replaceable thermometer strip, water volume indicators and a chemistry mixing well to make enzymatic use simpler and more consistent. The insert also includes a built-in device drain catch, which prevents small pieces from being lost down the drain. The handles on the sides of each insert also act as overflow drains to prevent spillage onto the floor. 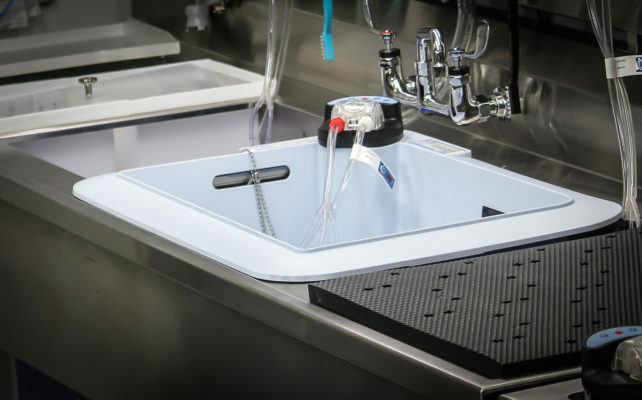 The lightweight, polyurethane construction of this sink insert makes it easy to place and remove from counters, deep sinks and mobile carts. Each insert comes with caddies to store small adapters, parts, brushes and solution. 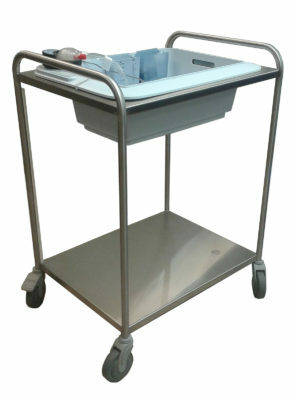 The insert can be used in mobile carts for storage, transport and soaking. The PureStation Mobile Cart can hold up to four (4) PureStation Sink Inserts. Clear transport lids are also available that slip on top of each insert. The lids are easy to write on (or attach biohazard labels to) in order to label biohazardous materials and prevent cross-contamination. 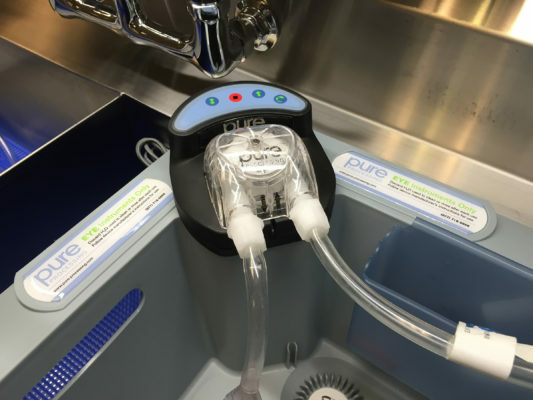 The FlexiPump Independent Flushing System can be included with the PureStation Sink Insert to add consistent, automated flushing into reprocessing practices. Note: Pure Processing can only provide pricing quotes with required dimensions. Please fill out dimensional request form. 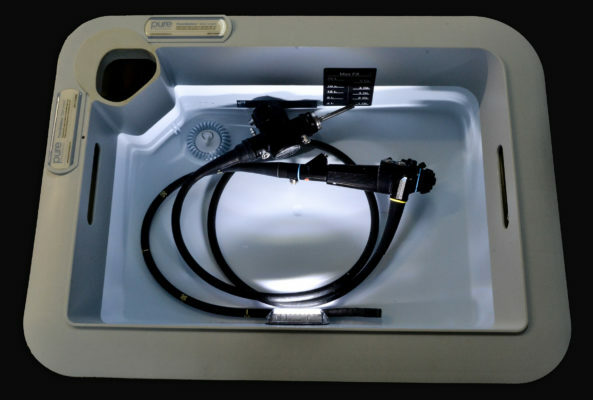 The PureStation Endoscopy Sink Insert’s interior LED lighting helps technicians easily identify bubbles during leaking testing processes. The PureStation insert improves efficiency by providing convenient ways to monitor and mix proper enzymatic solution concentrations. 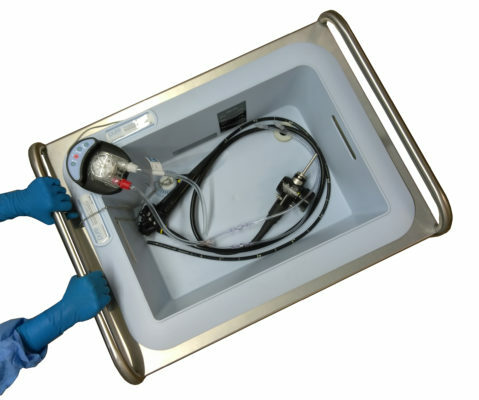 Each basin includes an interior LED light, a replaceable thermometer strip, water volume indicators and a chemistry mixing well to make enzymatic use simpler and more consistent. 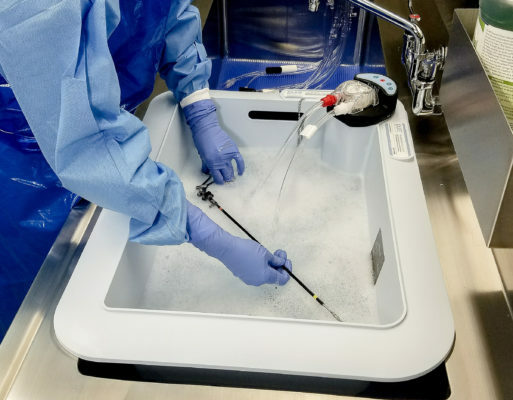 The PureStation™ Dedicated Eye Sink serves as a separate designated cleaning area for channeled ocular surgical devices. 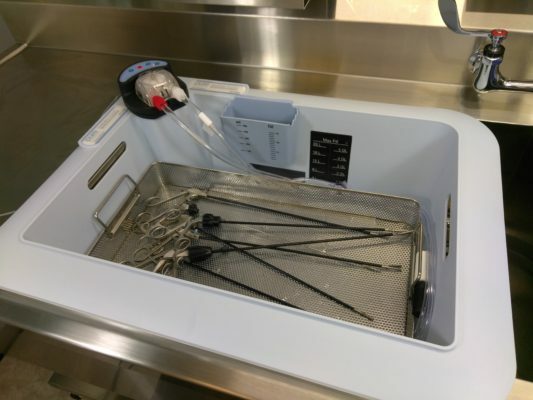 It is permanently labeled with specific instructions for eye instruments, and can be used on a counter top, in an existing too-deep sink to raise the work level, or on a mobile cart. The eye sink’s lightweight polyurethane construction and handles make it ergonomic to handle and carry, and provide a less abrasive contact surface than stainless steel for delicate ocular lumens and devices. It also features a chemical mixing well, water volume indicators and a thermometer strip to assure consistent solution dilution and temperatures. Caddies that secure onto the rim of the sink help organize pre-cleaning tools and solutions at the sink, and a drain catch prevents small adapters from being lost down the drain. 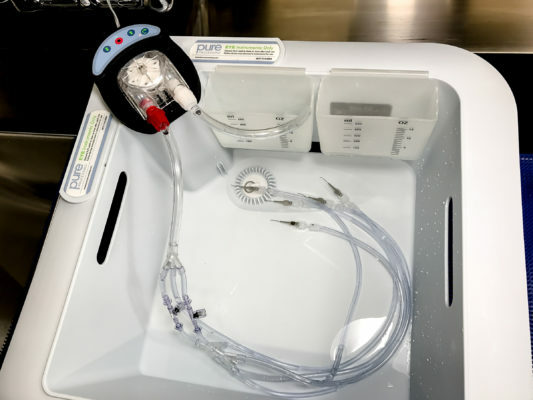 The PureStation Dedicated Eye Sink can also be used with the FlexiPump Independent Flushing System for copiously flushing ocular instruments. The FlexiPump system features integrated pressure relief valves to protect delicate eye instruments and allows up to five small-diameter lumens to be flushed at once.